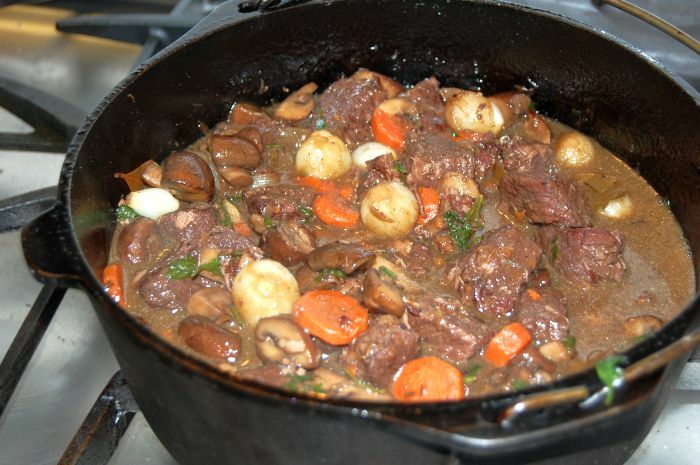 Boeuf Bourguignon, also called boeuf à la bourguignonne, is a traditional French stew prepared with beef braised in a red wine, such as Burgundy, and flavored with garlic, onions, carrots, herbs, and garnished with pearl onions and mushrooms. The dish was popularized in Julia Child's book Mastering the Art of French Cooking, and it was mentioned prominently in the movie Julie & Julia based on the book by Julie Powell with Meryl Streep in the role of Julia. 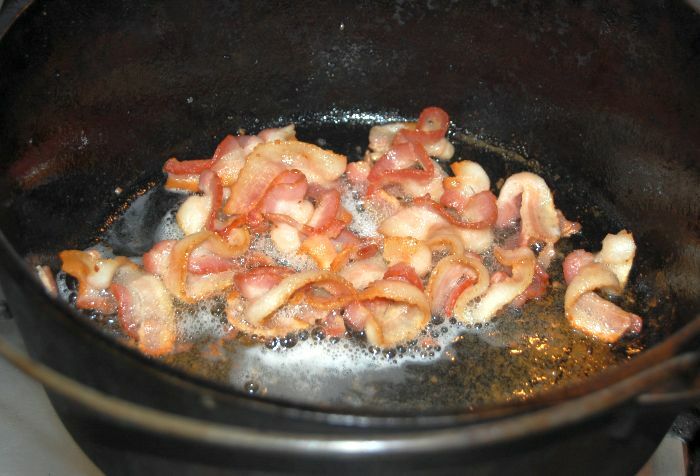 In a 5-quart Dutch oven, fry the bacon until it releases most of the fat and is lightly browned. Remove the bacon to a side dish using a slotted spoon. Pat the cubes of beef with paper towels to remove surface moisture and sauté them in the bacon fat until the cubes are browned on all sides. 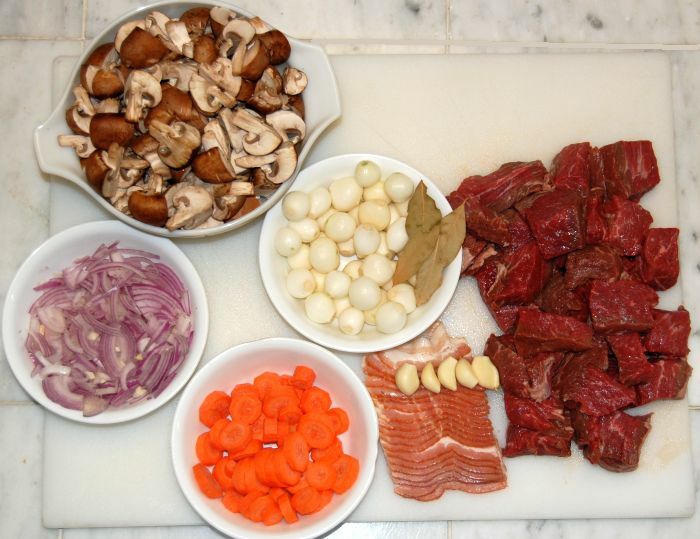 Remove the beef cubes to the side dish with the bacon. 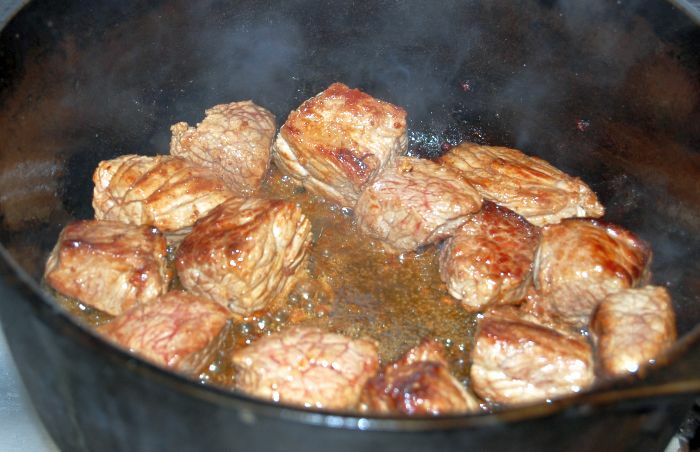 Sprinkle the flour over the beef cubes, and stir them to coat the meat uniformly. Sauté the sliced onions, mushrooms, and garlic in the remaining bacon fat. 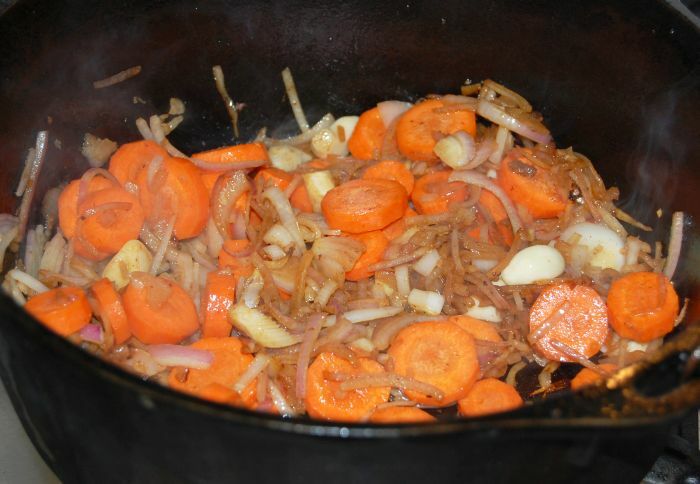 When the onions are transparent, transfer the bacon and beef cubes from the side dish back to the Dutch oven. Add the salt, pepper thyme, and bay leaves. Pour the wine and the bouillon so that the liquid just covers the meat. Bring to simmer on top of the stove, then cover the Dutch oven and set it in the lower third of the preheated oven for 2 to 2 1/2 hours until the meat is tender. 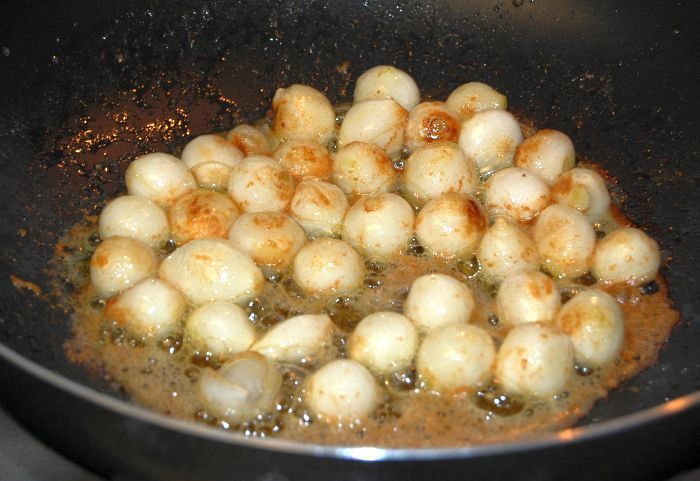 In the meantime, sauté the pearl onions in a frying pan using the butter and olive oil. 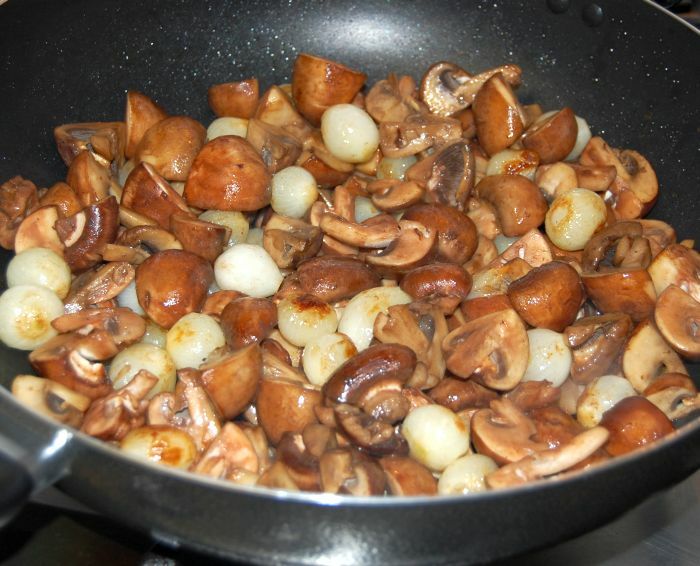 When the onions are slightly brown, add the quartered mushrooms and heat until the mushrooms release water. Cover the mushrooms and onions and cook about 10 minutes. Turn off the fire under the frying pan, but leave the mushrooms and pearl onions covered while the meat finishes cooking. When the meat is tender, transfer the onions and mushrooms from the frying pan to the Dutch oven. Stir, taste for seasoning, and simmer for 10 minutes. This stew is usually served on a platter surrounded with potatoes, noodles, or rice, and decorated with parsley.